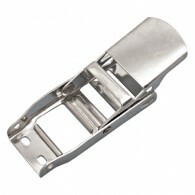 The Over-Center Buckle is able to accommodate a 1″ or 2″ webbing width and can be surface mounted. It is made from grade 304 stainless steel for corrosion resistance and durability. This ratchet buckle is ideal for marine and industrial tie-down and ratchet strap applications.